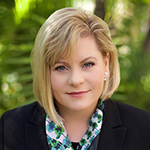 Stacey Pugh is Vice President and General Manager of Medtronic’s Neurovascular business area. She provides overall global strategic leadership, guides marketing and business development and is responsible for revenue growth. Prior to this role, Stacey was Vice President of Medtronic’s Neurovascular international business unit and was responsible for leading the company’s European, Middle Eastern and African business programs and developing trade strategies to support the global revenue and market share growth of Medtronic Neurovascular products. She has more than a decade of experience in medical device research, development and commercialization. Stacey has also held various leadership roles in Covidien’s Neurovascular division and clinical development roles at Kinetic Concepts. She spent the early years of her career in critical care and trauma nursing and nursing education, and directed the human subject research program for Texas Tech University Health Sciences Centers.